Four strategies that marketers can use to reel in, engage and sell more to today’s distracted media-consuming viewers. Marketers like to complain about how the era of the “distracted viewer” is taking its toll on their advertising returns. Call the teenager who peruses Snapchat or Instagram while watching Modern Family or the mom who is simultaneously online shopping, texting and watching her favorite programming “distracted,” if you will, but the reality is that today’s marketers have more consumer touch points and opportunities than ever at their fingertips–they just have to know how to take advantage of them. According to the Consumer Electronics Association, television continues to provide the best-quality picture and viewing experience. As we know, the way content is being discovered and consumed is changing—and especially for millennial viewers (born between 1981 and 2000, and currently aged 16 through 35) who are “cutting the cord” from their cable subscriptions. A recent CEA survey, for example, found that just 55 percent of millennials use TVs as their primary viewing platform, while streaming content via Netflix, Hulu and Amazon Prime–laptops, tablets, and smartphones–are poised to dominate their viewing preferences. So while television remains the key medium for brand building, it is an evolving space due to the proliferation of mobile phones, laptops, tablets and other devices that come between the target audience and the television itself, or even the way the content is delivered via over-the-top platforms. By definition, OTT is a term used for the delivery of film and TV content via the Internet, without requiring users to subscribe to a traditional cable or satellite pay TV service like a Comcast or Time Warner Cable. These apps and services are delivered over the internet, so users still need a broadband connection, which they usually get from their cable providers. Netflix and HBO Go are two good examples of OTT providers, with CBS, Showtime and Lifetime all recently announcing the introduction of their own OTT video services. Millennials are a particularly large target for today’s advertisers—and one that’s not always easy to pinpoint, hit and engage. The CEA sees multiscreen viewing of TV programming as a central factor in reaching younger target audiences. While the TV set is still the most commonly used device for watching content, about one-half of millennials watch programming on a laptop, another 28 percent watch it on a tablet and 22 percent on a smartphone. And while nine in 10 viewers say they watch TV programming on a television set, millennials are significantly less likely to do so (85 percent). In terms of preference, only 55 percent of these younger viewers select a TV set as the preferred screen for viewing television content. There’s been no better time than now to take advantage of the era of the distracted TV viewer, where 87 percent of people who watch TV are also second-screening on their tablets, phones and laptops. In fact, you can pretty much count on the fact that consumers are certainly “watching” search engines while they’re watching TV. And every TV commercial moment could spark a thought in a viewer’s head to go to a search engine. So rather than complaining about the fact that viewers are jumping on the web while TV shows and commercials are playing in the background, why not embrace the distracted viewer with a solid, cross-device campaign? It’s clear that audiences are being pulled in by the TV ads and then going to other “screens” to learn more, read reviews and make purchases. 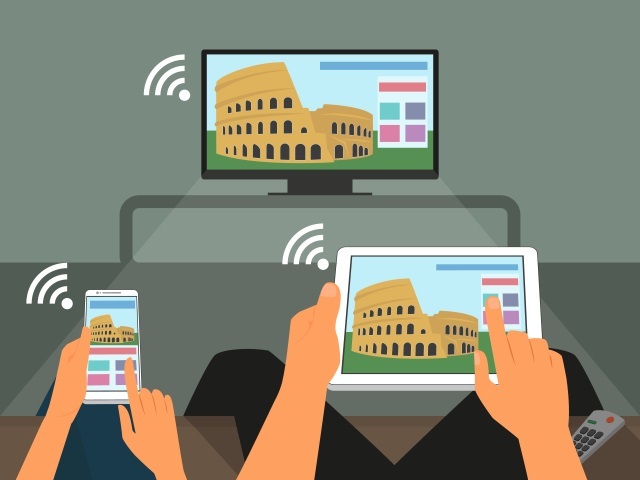 Develop creative messaging across all devices and platforms: Viewers expect a cohesive and seamless experience whether they’re watching TV, using a mobile web browser or watching a commercial on their tablets. Through creative messaging—tailored to each device—marketers can meet this demand while effectively harnessing viewers’ attention, and regardless of which device they’ve using. Each piece of the consumer’s experience should be consistent and complementary. Use solid analytics to measure results: Data, data, data–use it, analyze it. Along with the era of the distracted viewer comes the era of the smart home, analytics and metrics that allow advertisers to more effectively measure results and hone future messaging and campaigns. Companies should take advantage of these innovations and use robust analytics to take the learnings and integrate them into all of their campaigns, regardless of screen or medium. Hit them while they’re still on the couch: According to Nielsen, 27 percent of TV viewers look up product information online after watching a TV advertisement. Marketers can give these viewers what they’re looking for by aligning website and paid search campaigns to their TV ads. When TV-inspired viewers find the information they are looking for quickly—and right when the desire to purchase is peaked—sales conversion rates will improve exponentially. By developing creative messaging across all of these devices, leveraging OTT and using solid metrics and analytics to measure results, marketers can fully leverage the multiscreen phenomenon—and the distracted viewer that it has cultivated. Achieving this goal will require a bigger net, but the end result will be well worth it in an era where distraction is only going to proliferate. The speed of information, data and content is here to stay. Let’s not be afraid of it. Jessica Hawthorne-Castro is the CEO of Hawthorne, an award-winning technology-based advertising agency specializing in analytics and accountable brand campaigns.